WE’RE PLEASED TO ANNOUNCE THE FOURTH LIVE EVENT TO BE STAGED BY THE MOUTH MAGAZINE – AND WE’RE ABSOLUTELY DELIGHTED TO REVEAL THAT THE HEADLINER IS MILES HUNT, FRONTMAN OF THE WONDER STUFF. OUR EASTER SPECIAL WILL TAKE PLACE AT CAFÉ INDIEPENDENT IN SCUNTHORPE ON SATURDAY 4TH APRIL 2015. 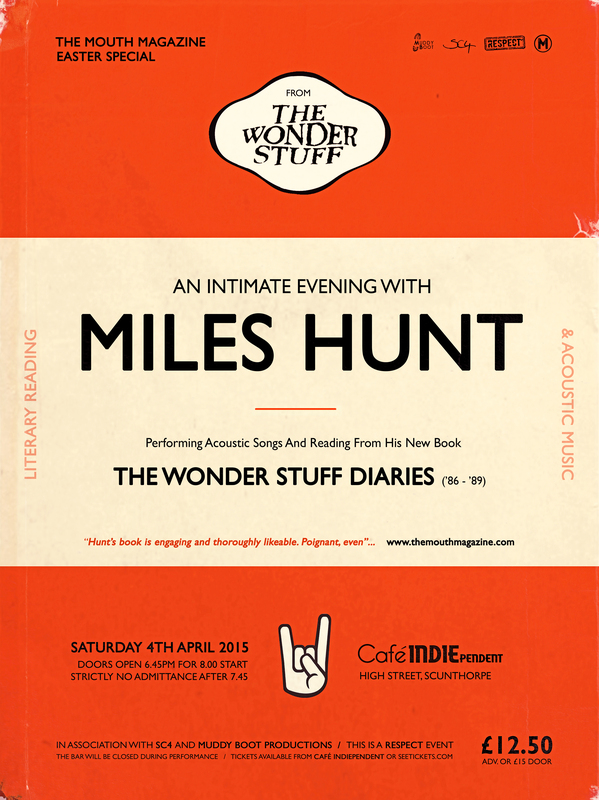 There will be two sets across the evening, during which Hunt will perform songs solo, read excerpts from recent memoir THE WONDER STUFF DIARIES ’86 – ’89 and take part in a Q&A. Originally based in Stourbridge, West Midlands, Hunt formed The Wonder Stuff in 1986. The band was signed by a major label within just a year and went on to release four UK Top Twenty albums (THE EIGHT LEGGED GROOVE MACHINE in 1988, HUP in 1989, NEVER LOVED ELVIS in 1991 and 1993’s CONSTRUCTION FOR THE MODERN IDIOT) plus compilation IF THE BEATLES HAD READ HUNTER and 19 singles (17 of which were UK Top 40 hits – including WHO WANTS TO BE THE DISCO KING?, SLEEP ALONE, WELCOME TO THE CHEAP SEATS, THE SIZE OF A COW and DIZZY, the number one smash featuring comedian Vic Reeves on vocals, in 1991). The Wonder Stuff eventually split in 1994, Hunt first forming another band (Vent 414) and then going it alone. Since then he’s recorded and toured as a solo artist, or with his partner Erica Nockalls – and as part of a new version of The Wonder Stuff. His recently published book doesn’t attempt to dismiss or correct bad behaviour, poor choices, silly mistakes or petty indulgences back in the day; Hunt is not shy of being self-critical or, occasionally, scathing of his younger self. The story of his rise from Black Country post-punk obscurity to frontman of one of the most well-loved indie-pop bands of its time is laid out in parallel threads; contemporary journal entries and then with a quarter-century of perspective from which to comment. The second reveals him to be thoroughly likeable, and makes THE WONDER STUFF DIARIES ’86 – ’89 all the more engaging; poignant, even. Listen to Hunt reading a brief extract, below. Previous shows hosted by The Mouth Magazine include the AUTUMN SPECIAL headlined by Rachel Sermanni (in November) and the WINTER SPECIAL headlined by Martin Stephenson of The Daintees (in January). Highlights of both gigs featured in special editions of The Mouthcast (Rachel Sermanni here and Martin Stephenson here). They were delightful evenings – intimate, good-natured and with an indefinable magic in the air; so much so that Rachel Sermanni requested to come back as soon as possible. She headlines our SUNDAY SPECIAL on 1st March (more details here). Miles Hunt’s appearance at our EASTER SPECIAL is also likely to be something to remember. Doors open at 6.45pm for an 8.00pm start, and admission is £12.50 in advance (or £15 on the door). There will be no admittance to the venue after 7.45pm. Tickets are available now at SeeTickets (here) for those living outside of Scunthorpe (North Lincolnshire) and surrounding areas. Physical tickets will be available at Café Indiependent itself in the near future, if you want to avoid paying booking fees. Click the poster for the EASTER SPECIAL (above) for further details.